First let me say thank you to all of you who have been reading this blog. It was never my intention to try to be a blog that lots of people read, but I am really enjoying getting the feedback and seeing the numbers grow. Secondly, let me say how gosh darn excited I am by the emails I have received on my Seven Day Carry idea. I love that you all want to see it and that you don't want me to wait until Monday to start. The reason I picked Monday to start is that my 4th of July weekend is nuts. I will probably take pics and record my activities, but I don't think I will have the time or energy to post. I normally write my posts at night after my kiddos are asleep and then I post later, usually in the morning before I head off for my day, but this weekend does not allow much down time. Thirdly, I want to let you know that, That Texas Lady is having a holster give away on her blog and another give away on her FaceBook Page. So, go like her page and check out her blog. Lastly, I want to encourage all of you who might be new to the gun world to find places in your area that you can network and grow with people who know what the heck they are doing. The NRA is a good place to start, but I also look locally. I belong to a regional shooting club for woman(I have not been to any actual events, but I have benefited from the conversation and socializing online with the woman). I also joined a state organization that advocates, strongly, for the gun rights of the fine folks of this state and keeps it's members abreast of all the issues that impact gun owners. Find one in your state and get involved. Also, if you are brand spakin' new like me, get some training and then more training. I am hoping to go to an advanced course in July. Again, thanks for stopping by. You have given me a great joy! Decided to carry at the swim meet. In a neighborhood I don't know and my husband is not coming until later. Lots of little kids, so I am wearing a black cover vest. 102 degrees with no shade! Toasty. Starting next Monday I am going to post for 7 days what I wore that day. I will also include what the temperature was that day, what holster I used, gun I carried and what I did that day. This is me in that ever popular black shirt getting ready to head out for my day. It is a beautiful day here. Sunny, 81 degrees with only 61% humidity. No chance of rain! I am carrying my Ruger LCP in a Crossbreed Micro Clip. Personally, I am not a huge fan of this holster. It only has one clip, which at first I thought I would love, but on me, it doesn't work that well.. Having only one clip makes it more concealable, but it also slips down my pants sometimes. These particular shorts are too big for me, especially in the rear. You will see that in the next pic. As you can see, my pants are a little saggy because I have upped my summer workout routine and it is working, so my hips have shrunk a bit. You can also see a tiny bulge and the clip sticking out. I re-shot the picture so the clip didn't show, but then I realized that isn't very realistic. Unless I am standing perfectly still for a photo shoot, the shirt moves and without a cover garment, this is most likely how I look while concealing this gun in this holster with these clothes. I left the house with the gun loaded and chambered inside the holster inside my car safe. The safe was open on my seat next to me. I drove to my kids swim team practice, locked the safe and put it with the gun inside my glove compartment and locked that. After practice, I put the holster and gun on and went to Ta*get for supplies. I did not wear a cover garment and was not overly conscious about "hiding" the gun. I kept it covered up, but I did a lot of bending and lifting, so chances are most of the time it looked like the above picture. I came home, put away groceries made lunch and am still wearing my gun. Tonight I will head with my man and 2 of my children to their swim meet and have not decided yet what our carry configuration will be. I know this is suppose to be "Whatcha Wanna Know Wednesday", but the post I am working on isn't quite ready, so I decided to post a few pictures. If I am able to get the the other post done, I will put it up later today otherwise, I will save it for next week. My friend posted some pictures of her boys with their guns on her FaceBook. I made a comment that I loved the picture, but wanted to see" Her Girl and Her Gun". This is the picture she took for me. LOVE IT!! Last night our oldest son came over for dinner and we discussed the early events of my day to include when my husband broke back it our house. He thought it would help my mind set if he gave me a "tattoo", so he drew this on my chest. I don't want you all to think that this black shirt is the only one that I own, which is why I am not going to tell you that I am also wearing it as I type. This is our daughter's birthday present. She turns 8 next month and wants a pink gun. It is a Thompson. It doesn't have the bolt action which I wanted, but it is a nice little gun and I think she is going to have a blast with it. This is my man and our soon to be 8 year old daughter at the Veteran's Day luncheon. Our Family at The White House. I was not carrying:) It is becoming increasingly difficult to keep my identity hidden and I do not have the time or energy to keep it up. The main reason I wanted to keep my name and pic on the down low was because of fear. That ever present word in my life. As I try to combat that being that lives inside of me, I take baby steps forward to confront the things that keep me awake at night or the things that keep me from doing what it is that I want or the things that in some way control my life or take away from it. Some fear is good. It is a warning and should not be ignored, but some fear, most fear, is limiting and exhausting, it is this demon I chose to try to eliminate. So, there I am for all 300 of you to see. This morning my husband left the house with our 13 year old daughter as he always does. I locked the door behind him and turned our alarm on to "No Entry" as I always do. I grabbed my gun, rounded up the 3 little ones and headed upstairs. I put the kiddos on our bed, turned on some Pink Panther to keep them occupied while I got ready for the day and went into the a joining bathroom. When I am home alone with the kids I like to take a bath as opposed to a shower because that way I can see them and be sure they are in fact doing what I told them to do. Honestly my kids are very well behaved and do what I say, but they are kids and why risk it. Also, when I am home alone I like my gun to be loaded and on me. Can't really do that when I am in the shower and I don't want 3 young kids steps away from a loaded gun while I am behind a stream piece of glass. This way I can have my gun in the condition I like it right next to me and still not be accessible to my little ones. Safety, safety, safety. My routine is pretty much the same every weekday morning. I run the bath water, brush my teeth, bathe. This morning I had just finished my teeth and was getting ready to get inot the bath when I head a voice that sounded like my husband's. I didn't panic because I knew he was gone and the alarm hadn't gone off. I assumed it was just the television, but I decided to go out into the hall to check it out just to be sure. When I did, I heard what was indeed my husband calling me from down stairs. He had forgotten his phone, so he came back to get it. When he entered our home, the alarm went off, soooo not wanting to get shot by me, he stayed down stairs and called for me to identify himself. Problem number one is that apparently from my bathroom with running water, I can not hear the alarm. I will be contacting the alarm company today to rectify that. Problem number two is that I suspected there might be an issue, but did not grab my gun or a towel. In short, I went into my hall way to assess the situation in the buff without a weapon. You know how they say, you will never know how you will react until you are in the situation? Well, evidently, I react like I am in a B-rated horror movie. All that was missing was a pair of heels, some blood curdling screams and eerie music. If you are new to guns or have been around guns for a long time I think you will love the articles on Guns.com. What I love about the site is that it has all the regular kind of things you would expect a gun site to have like reviews of different models of weapons and updates on the latest gun laws, but it also has articles about the history of guns and gun fighters as well as a forum section to ask questions or to just chit chat with people about all things guns. Oh and they have giveaways, This one only has a few days left, there is still time. If you have been reading my blog then you are aware that very early on in my gun life, I went to a local gun show and while there, I met a guy who specializes in Glocks. You also know that I ripped him off and from there, we began a very special friendship. This past Saturday he and his lovely bride came to our house for dinner. We had a great time. We talked about family, food, careers, our shared dreams of moving to the same state and, of course, guns. I pride myself on my cooking skills and on my ability to spoil folks and make them feel special. I love to plan and try to make food that the people coming over will truly love. I was extremely excited because My Glock Guy said that he and his bride were kind of foodies. I love that!! I wanted to make one of my original creations to wow them, but since I was also volunteering at the gun that morning and afternoon, I decided to put pride aside and make something less extravagant. My choice...to start, homemade guacamole and salsa. Cooper cheese, a nice salami, assorted crackers,and bacon wrapped shrimp. The main course: smoked bbq pork and beef ribs with my world famous homemade bbq sauce, fresh local sweet corn, my world famous salad with homemade dressing and some yummy Kiren beer, which is famous, but not homemade. Now, I know this meal is not original or all that creative, but we are kind of known for our ribs. People often leave our house raving about how they do not really like ribs, but ours are so delic and my sauce is known and loved by folks in counties all around us. I thought this was a safe bet. Food that was easy to make while I had other commitments, but also pretty darn tasty. It turns out, I should have tried to rip off the rib guy at the gun show(there wasn't a rib guy at the gun show), because my ribs were awful! Our grill freaked out and flamed up like crazy. We are not novice grillers and by we, I mean, my man. He can seriously grill some amazing grub and, of course, he has had flare ups from time to time, but this grill went rouge and burnt the wholly molly out of these beautiful babies. We thought we might be able to salvage them and finish them in the oven. Not so much. I do think that might have been possible, but we talked and talked and talked and by we, I mean, My Glock Guy and My man. The ribs were pretty much jerky by dinner time and not even good jerky, which you all know I love. It was like carbon jerky, which is quite a feat in itself as most carbon, just kind of falls apart. Not this stuff. This bone of black could be chewed on for a good while. Fortunately, I thought ahead and decided to make the shrimp more of a scampi side dish as opposed to an appetizer and that way people could just skip the ribs and enjoy the seafood...NOT! My shrimp sat in a bowl with saran wrap over them to keep them to keep them warm. Except that that an hour later they were not so much warm and freezing cold, which turned them into nice rubber chew toys. My French Britney, Finn, would have found them to be quite a treat. My Glock Guy is not only an amazing Glock Guy and very sweet, he and His Girl are also very gracious. Thankfully, they brought Se Ju. We had never had this particular libation before, but found it to be a lovely refreshment! My man, who rarely drinks, particularly enjoyed it. Other than very bad food and might tasty alcohol, I learned that my night sites are not right for my gun. About 3 weeks after I had my gun I went into a large outdoor super store to buy a holster. While there, the very nice gentleman who offered to help me told me I should get some night sites. He handed me some sites and me, without asking a single question, bought them. It turns out that while he was indeed a very nice guy, he was not all that helpful. This was not the only piece of erroneous gear he sold me. The holster he suggested sits in my gear box, unused. I wrote about this fine, over 60 gentleman in my post Guns, Holsters, Conceal Carry. He is my "fifth" point. I learned from my Glock Guy is that my sites are way too long for my rather small Glock. It turns out that my grip might not be the only issue as to why my shooting has tanked as of late. Let me say, I am not using my sites as an excuse for my substandard skills. My man shot my gun with those sites and did just fine, but I am not there yet. I can use all the help I can get and if different sites can help me compensate for my lack of skills until I am able to compensate myself for substandard equipment, then I am all for it. What the night taught me...#1 I love my Glock Guy. #2 I love His Girl. #3 My shooting is not the only thing that has tanked recently. #4 I need new sites. #5 A large outdoor super store might not be the best place for a novice shooter to get her "expert" advice. #6 I love guns. #7 Rib jerky stinks .#8 Rubber shrimp stinks. To be fair, I already knew #6, #7, & #8. #9 My guy is even more smokin' hot after a shot or two of Se Ju. I went to the gun show yesterday running a tiny bit late because once I got inside the convention center, I wandered around trying to figure out where I was supposed to be. Luckily for me one of the first people I saw was my Glock Guy and he took me to a very nice man who had the layout for the place and he directed me to the right spot. I found my table and met the coordinator for the organization I was volunteering for. He gave me the low down on my responsibilities which were pretty much to tell people about the organization. A little while later, the gentleman I was volunteering with showed up and we went to work. The show was pretty slow. The first show I had been to was packed. This was nothing like that show. I asked the head guy why it was slow and he informed me that the reason the other show was so big is because it was in conjunction with an outdoor show. Interestingly enough, even though that show was packed it did not produce much profit apparently. I guess the outdoor boat folks are not all that serious about their guns...fools! So, I signed up a few people for the email list, sold a few items, and had some very nice conversations with some neat folks. One guy came up to the table and picked up a book we offer for sale on the laws concerning people who carry and travel through the different states. He flipped through two pages, tossed it back on the table and told me the information was wrong. I had a brief moment of panic because, of course, I do not know all the gun laws of all the states and I was not sure how to handle the situation, so I decided to ask him if he could show me where in the book he was looking and what information was incorrect. I thought at the very least I would be able to show the people who know and they could either confirm that the info was wrong and needed to be corrected or tell me why the info was, in fact, correct. As it turned out he was in the section of the book that was not explaining whether anything was legal or not, but simply explaining the terms that would be used in the book. So, I was able to explain that to him, he seemed satisfied, signed up for the alerts and went about his day. I am a huge hit with the over 60 crowd. I don't know why, but older people love me. I had several very nice conversations with people in this age demographic and with the exception of just one, I either got them to sign up for the email list, a membership, or purchase at least a bumper sticker. It was funny because the one guy who was not the least bit interested in getting another email from another organization was not carrying his gun based on information that was either outdated or just plain wrong. He was very excited to converse with me and learn about what had changed and even though that is the exact kind of information this organization provides on a weekly basis for our state, he would not give me his email. I also had a gentleman that wanted to buy a hat, but he only had a credit card and I knew we took cedit cards, but I didn't see any slips, the other volunteer had left for the day, so I decided to try to use the membership form with the bottom part containing a place for credit card info. He was not satisfied with this, so I said why not just sign up for a membership and add the hat? He decided I was a flake and walked off. Not good. I asked the man in charge when he returned about the credit cards purchases of things that are not memberships and it turns out, they do indeed just modify the membership paper. I think next time I just have to be more confident instead of making it seem like it was some cleaver idea I just came up with. Even though I did think it was a clever idea and I had just come up with it. When I was done volunteering I went off in search of a pink youth gun for my 8 year old daughter's birthday. I looked and looked, but no one had what I wanted. Finally, my Glock Guy steered me to a certain dealer. I went on over and saw everyone was busy, but then I saw this young kid working on a computer and I asked him if he could help me. I told him what I was looking for and he giggled. I said, "Hey, this is not for me. I carry a black .40 Glock. it's for my daughter". I smiled. He smiled. We were good. He wasn't sure if they had the nifty pink piece of weaponry I desired, so he asked. Yippeee, they had what I wanted. As I filled out the paperwork for my find, the young kid and I had a very nice conversation and he confessed he didn't know all that much about guns. We traded stories of shared neophyte-ness. When I completed the paperwork, he told me it was taking about 15 minutes for the checks to come back, so I decided to walk around the gun show and call my husband. While I was on the phone with him, I passed some wallets that looked pretty snazzy. My man is forever complaining about his wallet, but for whatever reason he never buys one, so I asked him if he wanted me to pick one of these up for him. He said sure and we discussed color and other specifics, I grabbed the one we agreed on and waited because the salesman was busy. I just walked off with it. I do not know what it is about gun shows that turns me into a criminal, but I could not believe that I had once again ripped off someone at a gun show. If you are new to my blog then you need to go back and read my first gun show experience to truly appreciate this post. In a panic, I hang up with my husband, returned to the booth and confessed. Me: "Umm, excuse me, I just stole this wallet". Everyone from about 10 tables around looks at little ol' me. Me: "I don't know what happened I was on the phone with my husband discussing color and style and then I just walked off with the wallet". Wallet guy and everyone else laughs. Wallet guy: "No problem, but I am gonna have to charge you double". I did purchase the wallet, but he did not charge me double.Instead, he gave me a $3 discount because I was a vendor. I am not a vendor, but, you know, I was volunteering at the show. So to wrap things up, I was a little late, someone nice helped me. I volunteered and got to share my love of guns and advocacy with a few nice people. I bought a gun for my daughter and a very nice young kid helped me. I stole a wallet and a very nice guy gave me a discount. See why I love the gun shows? People are just so darn nice to me! This weekend I have the honor of volunteering at a local gun show. I will be sitting at a table for an organization that promotes and advocates for gun rights in my state. I have always volunteered and done what ever I could to support the different causes I believe in. I think it is important to be heard and to fight for what one values. In all the changes that have taken place in my life of late, this passion to do, is not one of them. This has always been a part of who I am. I am so excited because I love gun shows. I love everything about them. The smell, the crowds, the humidity, the beef jerky, the rows and rows of guns, the bumper stickers I would never put on my car, but buy anyway and the people...I love the people, every single one of them. The Rednecks, the yuppies, the old timers, and all of the little kids running around!! I texted my hubby to see if my volunteering this weekend would interfere with any of his plans and he said nope, go for it. "Never in a million years, would this thought have ever run through my mind:) You working a gun show. Crazy, but crazy good." The whole experience was a hoot. I saw this sign and thought is was hilarious because I used to live in California and I thought, it was because they are so liberal and goofy. Shows how little I knew about any issue related to guns. The real joke is that they are liberal and goofy, which means they are very un-gun-friendly. I actually loved living in California. I lived in a more conservative part of the state and I didn't carry at the time, so the issues that concern me now, didn't then. Lots of gun folks do not like California, but it has many wonderful things about it. The ocean and the mountains...stunning I am in love with Big Bear. Camping in the Redwoods leaves me speechless every time. The weather is gorgeous and the food is amazing! I was teaching college back then and I loved to teach. I loved my students. I loved getting to see their minds working. I miss it. It was a very happy time in my life. We left California after the death of my brother. Not because of it, but after he died, the Marines sent us here. It was a bumpy few years and this place has never felt like home, but after 7 years of building relationships and watching my kid's roots begin to grow and get deeper here along with my new passion for guns, I am beginning to feel my neck turning a slight shade of red and as much as I keep trying to get out of here, I am not sure I could leave. Hopefully, I will have lots to tell you about after I volunteer. As the numbers of readers increase, so do the number of questions I get. I have been surprised by how many of the questions are more about me than anything related to guns, but then maybe that is why you all read. We share a love of people. I have wrestled a bit with how to address these questions. After tossing around a few ideas I came up with "Whatcha Wanna Know Wednesday" If I get a question that I think might be of interest to someone else, I will write a post about it. I am the question girl and I have been so lucky to be able to ask lots of people lots of lots of people and they have all been very kind to answer, so I am happy to do the same. This weeks question is Do I Always Carry My Gun and if not Where Do I Keep It When I Am Not Carrying? I have actually started half a dozen posts on this topic, but I can never quite say what I am looking to say. My first post was a kind of "Day In The Life Of". I wanted to describe a typical day of a girl, that's me, who carries, but I don't really have a typically day, so I ended up explaining and explaining and explaining. I had so many asides that it wasn't clear what the post was about, so I scrapped it. I also struggle with how much to tell. Where is the line between informing someone who is curious and sharing to much? Not sure I will ever know that answer, but it is good to be aware of the question regardless. The past few weeks the question has been asked a couple different times by a few different people, so I will try again. I do not carry everyday, everywhere, 24/7. When I first bought my gun, I did. I carried it everywhere and if I could not carry, I did not go. This was mainly because I was terrified, but it was also because the people teaching me about guns, said carry, all the time. I respect them and I did not trust myself, so I did what was most often recommended. For me though, I started to have some internal conflicts about always having my gun and I started to feel controlled by it, instead of empowered. As I tried to sort out my fears and not give into paranoia, I had several issues come up. I wrote about some of them Here. So, in trying to find that balance, I have chosen to sometimes not be armed. This is not to say that those who choose to carry everyday, everywhere are paranoid. It is to say with my background and my personality and my schema, it is how my brain interpreted my circumstances. One of the greatest gifts I have been giving is that I have been surrounded by gun folks who have given me the freedom and permission to do what is comfortable for me, mainly because they are so darn comfortable with who they are and the choices they make for their lives. I am grateful for this. When and how often I carry, I am not gonna tell you. First, I don't think it is a good idea to tell the whole world or the 5 people who read this blog exactly when I am carry and when I am not. Second, because it doesn't matter. I have learned so much from so many wonderful people that have been open and honest and shared and shared and answered all my many questions, and offered me all their insights, which have helped me to form my ideas and opinions about what is best for me and my family. At the end of the day, one has to do what one feels comfortable doing. Taking the time to figure out for yourself, what you can live with and what you are not willing to live with, is always the answer. I will tell you, that I am with my gun more times than I am not. I prefer that if I am with my husband we are both armed. 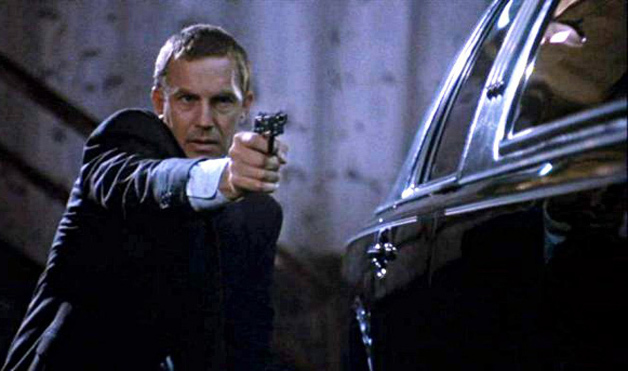 He is clearly the better shot and has much more experience in stressful situations, but still I don't want to be left without a gun and I truly believe I can help take care of any bad guy that comes around. However, there are time when just he carries or just I carry. Again the specifics are not important. As for the house, if my gun is not on me, then it is very easily accessible. I struggle with this one the most because my house is my safe haven. I love nothing more than to be home with family and friends hanging out, and keeping it as safe as humanly possible is paramount. Therefore, I am not all that hip on giving the bad guy a blueprint to where my weapons are. I do, however, know what it is like to honestly want to do the right thing , but not having a flying flippin' clue how to do that? That is probably why I got asked this question. People are looking for answers to things they struggle with. There are blogs, articles, books, people you can hire, courses you can take(I am gonna take one soon) out there that discuss home security in much detail and, of course, they know what they are talking about. This is not me. I am not giving advice or suggestions. I know many things, home security is not one of them, but I will share with you some of what we do. I think the ideal at home is the same as when out and about. Wear the gun, all the time. But just as gun laws often fall short, so do I from time to time. Wearing my gun all the time at home really isn't feasible for me. I have young kids and we wrestle around, we build extensive tunnels and crawl through them, we have massive water balloon fights that evolve into full on garden hose warfare. I often have 2 or 3 kiddos piled on top of me to watch a movie or read a book and a Glock on my hip just isn't conducive to my lifestyle at home with 3 small kids. I have 5 children all together, but my daughter is 13 and my son is 20. Neither of them sit on my lap anymore, although occasionally when I am feeling sentimental about my son being all grown up I sit on his and make him watch old VCR tapes of when he was a baby. For those times I am at home, but chose not to have my gun on my person, what do I do?? Without giving to much away, We do have a system. While I am not sure our system is all the special, I will say that for us, consistency is important. I always put my gun in the same spot down stairs and the same spot upstairs. The handle is always in the same direction and it is always in the same condition. Conditioning mean 1, 2, 3, or 4 I know I have a few people who read this blog that are like me and still learning the verbage associated with guns and a few of my friends who are like I was and are totally clueless, so for them I will explain a little. When guns are in different states of "ready" they are either in Condition 4 or Condition 1 or somewhere in between. I think this article does a great job of explaining it in plain easy to understand English Conditions Of Carry. While our children do not have access to our weapons, meaning they can't just go pick up a gun off the coffee table or the floor or out of my purse(I actually don't carry iu my purse), they do know exactly where the guns are. I think it is important that they know what is inside that box(safe) or why they are not allowed to go into said gun spot. As always I did a lot of research into this area and spent a great deal of time thinking and discussing what is the safest way to have guns in our home commingling with our children. For us, knowledge and awareness are key. All of our children, even the one who does not like guns, have handled the guns, empty, of course. We let them handle them and if they want, shoot them, but they are not allowed to touch guns if I or my husband are not around. We may have to adjust this as they age and get friends with parents who might have guns, but for now, DO NOT TOUCH unless dad or I are there is our family motto. For me and the mindset thing, I will not even let my children have toy or water guns. I think they are too young to distinguish between what is real, what is toy, so to eliminate the confusion, for now, the only guns we have are real, and they are not toys, so don't touch them. Every single time my 5 year old sees me get my gun out to put it on, he says, "DON'T touch." And he doesn't. The last part of the puzzle for us is our gun safes. We have 2 in the house and one in each of our cars. We have a place for our gear like holsters and magazine pouches(things you wear that hold extra magazines, the bullet holders basically) Our extra ammo is with it, but not our guns. We do not have a large gun collection, so storing guns here and ammo there with an extensive plan for not making it easy for the bad guy to get an extra gun and ammo, really isn't an issue, and I am assuming whoever asked me this question doesn't either or they probably would already know the answers. As our collection grows, we will have to address those issues. How'd I do, got a clear picture? I know you all are a shy bunch and nto the Chatty Cathy that I am, but if you have a method or idea to share, I am sure the folks who asked me about my carry, would love to hear from you. The more one knows, the better choices one can make. You may have seen this woman's story on the news or read about her in the paper or you might recognize her from her INK Commercial. To my knowledge she has nothing to do with guns and I certainly do not know her personally, but I love her story because it is a story of a woman who refused to be a victim and refused to give up. Often times when we in the gun/self defense community talk about not being a victim we are referring to actually being attacked or physically harmed, but as I journeyed to gun ownership I found my biggest obstetrical was my own mind. I have written about that many times in older post, but it bares repeating. People who succeed in life have a mindset of never giving up. Of never letting anything stand in their way and not letting anyone victimize them. That does not mean they do not get hurt, or stumble or that they don't ever doubt or struggle, but it means they will keep going no matter what. That they will fight and if they have to, they will most certainly get Mean, I Mean Plum Mad Dog Mean. I think I have that mindset, but I didn't know it I did. When I got scared, I freaked and retreated. For me it was a fine line between giving in to fear, allowing myself to be terrorized by the idea of what could have happened to me and having the courage to fight. Not just to avoid being harmed physically, but to have peace and joy. To have control over my thoughts. I was lucky because I had all the right people in my path. As I searched myself and all around me, I found kind, strong, knowledgeable people who, many without knowing, gave me all the tools I needed to not only avoid becoming a life long victim, but also to thrive and smile in the face of the man who tried to take that from me. Metaphorically speaking of course. I think you all might enjoy this short article on this woman because she is a fighter, her food looks insanely good and she has a potty mouth. I have found that gun folks have potty mouths. I have developed a new appreciation for the "F" word since becoming a girl with a gun. I am not sure I will start using it, but now when I hear it or read it, I kind of giggle and smile. In a strange way, it gives me a little joy. Hope you get a little something from her spirit. I was pleasantly surprised to get an email asking about "My Man" I giggled a bit when I read it, but of, course, who wouldn't want to know more about this extraordinary person?! Today seems like the perfect day to share a little about The Man behind The Girl And Her Gun. He is also from a small town in Iowa. He was a bit of a renegade, free spirit back when I met him. He had the business in front, party in the back classic hair-do that screamed ladies man and, yes, he had the following of many young ladies to match. We met at a friend's 21st birthday party and to be honest, I was not impressed. In fact, I remember telling my dad the next day about this total goofball I had met, who seemed too interested me, but, who, I thought was too good looking and too popular for my taste. Six months later, at the age of 20, we eloped to Colorado and I became his bride. It's your typical nerdy school girl meets gorgeous bad boy cliche that developed into a deep, deep passionate- thank- you- God -for- this- man -love- story. He is hilarious, unless you ask one of his children, who will tell you with an eye roll, that he is in fact, not all that funny, but no one makes me laugh like him. While his children will claim that is he is not at all funny, they often have a smile on their face when he is around and he is the very first person they go to if they need something fixed or a boo-boo kissed or a shoulder to cry on. He is fiercely protective of me and the children. He opens my door and orders my food. He gives me his coat and offers up his last bite of dessert to the little girl with a big smile on her face. He gets me my first cup of coffee every morning and he insists on doing the dishes. He carries a Glock and he knows how to use it. He has a screw driver and a hammer and has no idea how to use them. He is very steady and he calms me. His presence makes me feel safe and somehow just being around him makes me feel both feminine and strong. What might surprise you about him...he is a retired Marine without a single tattoo. He makes a killer Martini, but rarely drinks. He has amazing legs, and arms, and pecks, and, eyes, and, well you get the picture. I just started watching gun movies and/or movies with guns in them and, of course, I don't really know all the much about weapons in general, so I can not account for the accuracy of this article, but I thought it was a funny read. My husband reads all my post and he laughs and tells me I am brilliant, cuz he is awesome that way. However, yesterday after reading my post Bad, Bad, Day, he vetoed the body guard idea. So, having to rely on my own skill and since I was not all that confident in it, I headed back to the range. It turns our my man knows what he is talking about. I organized all of my magazines and placed my target on the stand, took a deep breath and shot and shot and shot. Looks pretty good and it certainly is a ton better than Saturday, but it wasn't where I was aiming. I shot a ton of rounds and still could not get it in the center or even higher than the center. I think at one point my hands were completely over my head and still, I was shooting below where I aimed. I understand I have a lot to lean and far to go on this journey, but shooting straight is fairly easy once you get the basics down and I have had the basics down and have shot straight before, so this was very annoying to me. I kept saying to my husband I don't understand. I am looking at the front site, it is lined up, the target is fuzzy and I know I am not jerking my hand to the left or down. The more I shot the more frustrated I became. It wasn't that I need more practice or that I was making a mistake that was bothering me. Of course, I need more practice and, of course, I am going to make mistakes. I was frustrated because I had not clue how to fix what was wrong. I kept aiming and shooting and yes, it hit in the same spot and was a nice little group, but I am perfectionist and kind of want to hit what I am aiming at. I am sorta funny that way. My husband told me to keep shooting and I did. He was watching my arm and my hand and he said, I was not pulling, jerking, or anticipating, so he said "this is suppose to fun, just shoot". So, I did, then he shot a few rounds and then me, then him, then me and then, it finally hit him, my grip. I was griping tight(but not too tight, settle down) and doing all the things I was suppose to, but my strong hand(for me that is my left) was not tight against the dovetail thingy, so when I pulled the trigger, it naturally was at an angle pointing downward. See the little 5 target in the upper left corner? See all the shots below it? Those are mine before the grip change. Please, nobody tell my shooting instructor. I vaguely remember, from the ringing that is still in my ears, him yelling, I mean talking to me about my grip. Also, don't tell anyone it had been about 2 weeks since I had been to the range and clearly, 2 weeks was waaaayyyyyyyyyyyyyyy to long. See all the shots on the 5 and pretty close to the it? Those are mine after I corrected my grip. I think I could have improved upon that, but I was out of ammo. Only brought 250 rounds. But, I left there with a big ol smile and a huge sense of relief. I had a reason and something I could work on. Feeling mighty fine, we went home and my man made me a celebratory drink. P.S. I had one drink, I did not drink and clean, time had passed and there was no ammo. I did not mix alcohol and guns in case you are wondering. If you follow the National Rifle Association on FaceBook than you have already seen this, but if not, watch it now. The sound is awful, but the words are catchy. I do not know what happened to me on Saturday, but I could not shoot worth a lick. My first 2 shots didn't even hit the target or the board that holds the target. That has NEVER happened to me before. Not even the very first time I shot. I was able to hit the target from then on out, but still not quite where I was aiming and it wasn't pretty. Like any new beginner, I blamed the gun. There was nothing that happened to make me believe that the gun had somehow morphed into a complete mess, but I think it is much better to blame the equipment than me. I mean who doesn't think it is a good idea to avoid responsibility and make it someone or something else's fault? After a few more rounds, I became completely frustrated and a little sick to my stomach, so I handed the gun to my husband, who proceeded to shoot an entire magazine, dead center, with a grouping about the size of a quarter. Yeah, it's not the gun. What I could not and still can not figure out, is what the heck happened to me?? In an attempt to make me feel better my husband took the small round target off the stand and put it up to his chest to show me, every shot would have killed the bad guy(just an aside, yes, we know that if we shoot a bad guy in the chest he won't necessarily die, but that is our lingo for now. In the chest means dead.) My man also said that everyone has a bad day at the range, that I am over thinking it and to let it go. Those shots are down range, can't be recalled, so don't even try. So, for now, that is what I am going to try to do, but one more day like that and I am going to give some serious thought to just hiring a bodyguard. This woman is the founder and head of the shooting club I belong to. She is a very impressive woman who has quite the resume. You know how I said I don't like mean people? Well, I still don't. I went to the store the other day to buy ammo for my gun and some for my son's rifle. I am standing next to the case with all the ammo along with another gentleman, waiting. The clerk comes over and asks him if he needs any help and he says, "no, I am just looking". The clerk walks away. I said, "umm I could use some help". Me- "200 rounds of the range ammo and 1 box of the personal protection ammo. Also some, .22 long..."
Clerk- interrupts me, "I don't carry long unless it is a for a rifle." Me- "Right, it is for a rifle." Clerk- Looking at me through the top of his glasses, "Are you sure? you can't return this stuff?" Me- "Yes, I am sure, thank you." Clerk- He rolls his eyes. I mean he literally rolled his eyes. Now, I do not know this guy and I am not entirely sure what his problem was, but I am going to say from his body language and tone he used, he assumed I was a moron, probably because I am a woman. I say this because the interactions he had with several of the male clients did not get the same kind of grumpy pants attitude that I was blessed to get. First off, I did know what I was talking about. There was nothing in my demeanor or in my tone that would make you think I was nervous or unsure about what I was buying. Just because a person is not a boy doesn't mean they do not know what they are talking about. Second, most of the time I have no idea what I am talking about. I know my gun and that is about it. I shoot the same exact kind of ammo every time and I pretty much only shoot my gun. I am brand spankin' new to this stuff and there is so much to learn. If you want to show off how much you know or if you want to use your knowledge to show how little I know, this can be accomplished right quick and with my full cooperation. I do not think it much matters if I know what I am talking about or not, it is not your job to make me feel stupid or uncomfortable regardless of my knowledge of said subject. This is a lesson I taught my daughter years ago. Being smart, skilled or knowledgeable in no way makes you better and it certainly does not warrant being an, if I cussed, I would say a word that starts with an A, but since I don't I will just say grumpy pants. This reminds me of when we lived on Camp Pendleton before 9-11 and before 100% ID checks were required. The Marine Corps requires those who work and live on the military base to register their car and to then place a sticker on the windshield of the car. They have different colors to distinguish enlisted Marines from Officers. When a car comes through the gate, if the gate guard sees a sticker that says this is an Officer's car, they are supposed to salute, regardless of who is actually driving the car. Many times when I would drive through the gate the guard would assume I was the wife and not the military member and therefore would not salute. One time my daughter asked me if it bothered me that the guard did not salute since dad was an Officer I explained that it did not bother me because I did nothing to deserve the salute. I did not warrant the salute and I do not believe in privileges by association. However, I also said that by the guard not saluting he is saying something about himself. It is true that in every walk of life there are people who are not nice and who use their position to make others feel less and there are, of course, Officers and their wives who use their position to belittle enlisted Marines, but that should have no bearing on how one conducts himself. To me when a Marine does not salute, he/she is showing that he/she is not proud of who he/she is. If I drive through the gate and there was no salute, I would smile and nod and be on my way, but if I drove through the gate and some young Marine snapped to attention and saluted, I smiled and got teary eyed. For 20 years my eyes welled up with tears every single time. Not because I deserved it, but because he clearly had pride in who he was and what he did and there is very little that moves me more than a Marine who gets who he is. Plus, seriously, who does not getting a little tingle when a Marine salutes?? My point is, even if my status or my knowledge is far less than yours, I deserve the same amount of courtesy as you. The same amount of courtesy I will always give you, regardless of how you treat me. I wish I was a more willing to deal with possible confrontation because looking back, I should have politely told the clerk that I did not appreciate his attitude and I should have left without purchasing the ammo. I am not quite there yet, but I am beginning to think it is time for me to learn how to stand up for myself a bit more. This is my 8 year old daughter shooting a .22 riffle at the range. She loves guns and she love the color pink. This is her shooting my Glock. The .40 was a bit much for her and she was not a fan. I have a personal FaceBook page under my real name. I only have 20 friends on that page because I post information about where we live and about our kids, so I only accept people that we both know and have a close relationship with. 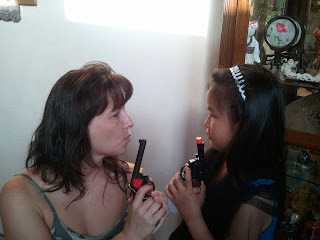 I am very protective of my kiddos and up until recently I have been a pretty private gal. As I have posted more and more comments on different gun related FaceBook pages, I have been receiving a lot of friend requests from people I don't know. One of the best things about the internet is that it can bring us closer to people that we never would have had a chance to meet. I have met some very neat gun people through the internet, which I am grateful for. I get excited to meet new people. I love learning about other people, their lives and experiences, but I am still protective of my family, so with help from That Texas Lady, I created a FaceBook page that I can use to post comments and make new friends without exposing my kids to the public me. The page, not surprisingly is called, A Girl And Her Gun. I just created it today, so I have not really posted yet, as no one knows it is there, however, if you would like to follow my daily haps instead of just reading my occasional ramblings, then you can like the page and we can be friends!!!! On my ever increasing quest to learn all I can about guns and everything related to them. I have stumbled across a few neat sites. That Texas Lady: How About A Give Away??? That Texas Lady: How About A Give Away??? : "Since it is Wednesday and my CHL requirements are gathered and mailed and since my gun is at Ruger and I have nothing better to do. I though..."
Fuuny, the NRA just posted this story about guns on college campuses. My daughter, who is 13, and if you remember from an earlier post, is pretty anti-gun, attended a school assembly last week. The focus of the assembly was safety in school and the community, so the school had invited the local sheriff to come speak to the kids. After his presentation, he asked if anyone had any questions. My daughter raised her hand and ask him, "How do you feel about guns in school?" He said, "I think the schools are safe with the armed security guard that walks the campus." Not satisfied with that answer, she again raised her hand and asked, "But, how do you feel about people having guns in school, to protect themselves?" Officer, "You mean the students?" My daughter, "I mean the teachers and staff. Do you think if the laws would allow for law abiding citizens to carry then the tragedy at Virgina Tech could have been prevented or at least not as bad as it was?" Officer, "I do think if a teacher had a gun, it could have lessened that situation, yes." My daughter, "What about parents?" Officer, "I would have to think about that." My daughter, "You haven't thought about it? You don't think if a parent is a law abiding citizen and has their conceal to carry license, they should be allowed to have their gun with them at a school, where it is becoming more dangerous?" Officer, "Yes, I would say if the parent had the proper license they should probably be allowed to carry at the school." Fellow student, "Cool, how old do you have to be to get one of those licenses and carry a gun?" My daughter, "21 for conceal carry and 18 for open carry, in the state of..."
Officer, "That is correct. You sure know your stuff." When our daughter got home from school, she could not wait to tell us this story. She said, mom, I was very respectful, but I thought it was important that I find out how he felt about your right to carry. For me this story is less about guns and my rights and more about who my daughter is. It moved me to see that my husband and I are raising a child who is civic minded, bold, and respectful. Regardless of what this sheriff thought or what his answers were, she had the courage and poise to ask what could have been a controversial question and she asked in front of her teachers and peers. What I love about this story is, that clearly my daughter, who disagrees with me, on the issue of carrying a gun where ever I go, respects my rights to do so. I love that while we do not agree on an issue, she not only isn't trying to change my mind, she is checking to be sure my rights are not going to be violated by those in charge of enforcing the laws. I love that she understands that just because she feels a certain way that does not mean she has the right to force that opinion on others. I love that she is listening. I love that she has respect for the laws that govern our land. I love that she understands how important The Constitution is and how important it is for all of us to uphold it's values. I absolutely love that I am her mom.